A couple days ago we got our first look at the upcoming fantasy action/thriller film Monster Hunter. A photo from the set of the film, uploaded to Twitter by Sony’s official account, shows actors Milla Jovovich (Zoolander, Fifth Element) and Tony Jaa (Ong-Bak) in their costumes and Jaa is seen toting a very large and intimidating “Jawblade”. It is similar to a weapon that can be found in the Monster Hunter video game series from Capcom, which the movie will be loosely based upon. Jovovich’s character goes by the name of Natalie Artemis while Jaa is the Hunter. Paul W.S. Anderson is directing the project. 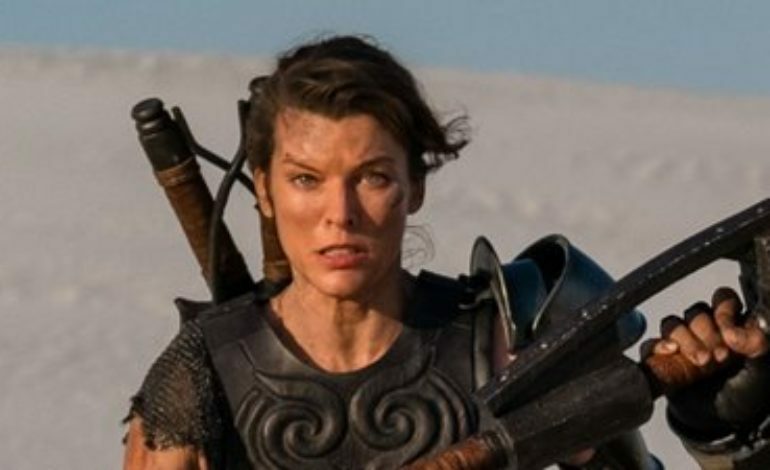 This isn’t the first time that Jovovich and Anderson have worked together on a film adaptation of a video game series, as they worked together on the Resident Evil film franchise. Movie adaptations of video games have had a very infamous past of many critically unsuccessful and commercially well off heaps of hot mess (With Resident Evil as no exception) with films like Tomb Raider, Doom, Assassin’s Creed, Super Mario Bros., and many more. This consistent trend has drained any possible interest from a number of fans and moviegoers alike, but we still have yet to see the performance of Monster Hunter. Starring alongside the aforementioned actors will include T.I., Ron Perlman, Meagan Good and Diego Boneta. The film will be produced by Capcom and distributed by Screen Gems.